KTQ® (‘Kooperation für Transparenz und Qualität im Gesundheitswesen’ – Association for more transparency and quality in the healthcare sector) defines guidelines for the healthcare sector, which are often implemented in hospitals as an alternative to ISO 9001 in order to comply with legal requirements for the introduction and maintenance of efficient QM systems. 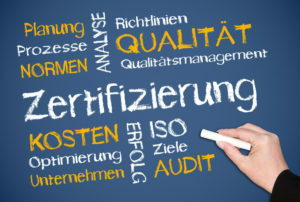 KTQ is the most widely used certification process in German hospitals. Rhein S.Q.M. consultants specialised in KTQ will conduct an inspection of your operations in order to compile accurate documentation regarding your current processes, and will offer assistance for the generation of required self-assessment and quality reports. We will use the KTQ catalogue of criteria to find practical solutions for the specific requirements of your facility in order to safeguard a smooth and trouble-free certification process. With the help of our experienced Rhein S.Q.M. consultants, you are guaranteed to receive KTQ certification quickly and efficiently. We can offer additional process security in cooperative projects with your own staff, ensuring higher customer satisfaction and increased kudos for your organisation in the public eye.